I come back to you now, at the turn of the tide. Riding bikes in the Pacific Northwest is just awesome. I started, you see, with the desire to talk about the various Pet Peeves of the Day that've been building up in my head here, but I think I'll take on the positive side this time. I've never lived in California or Florida or somewhere else that's pretty much always warm and sunny, but I rather have the theory that I'd get bored of it quickly. People say it's always rainy here, but, it's just not. Sure, few days go by that meteorologists can call “clear.” But, wow, when the sun does come out, everyone runs outside to go and play. It's totally Peter Pan. And, like children so famously do, we're great at of pretending it's a lot warmer than it actually is. I had a brief conversation with a customer yesterday who absolutely embodies this: He had on shorts and sandals. And wool socks, plus a fairly heavy Columbia Sportswear jacket. I'm thinking of this on Friday night, as I'm silently rolling back home from the the One Heart Cafe in downtown Tacoma, thinking of just how early everything around here shuts down. What, it's Friday evening at ten, T-town, and you're already closed? “It's not so much that everyone goes to bed early,” said Stephanie to me, “it's just that everyone's so lazy.” Downtown's Pacific Avenue gives way to industrial-gateway Puyallup, past the diners and cheapo motels (who stays there, anyhow? ), past the Amtrak station, over the eighty-year old bridge, and around the corner to pitch-black twentieth. A nighttime freight train crew works the tracks, their engine's low diesel rumbling temporarily drowning out all other sound, their flashlights and my bike's headlamp the only break in the dark. It's still dry as I roll through Fife to the brand-new Interurban trail segment, but a film of clouds blocks out the stars. It'll rain tonight. A day off at last, and I resolved earlier to ride up to downtown Seattle, to hang out a bit at its iconic Pike Place Market, including paying a visit to what I'd now call double-oh-three-oh-one – never mind the James Bond reference, it's the original Starbucks Coffee shop in the Market. It's a fun place, and I wish I had a camera-phone to show you some of the silly factor: it's as much a tourist attraction as coffee shop. “Hi! I'm calling you from The first Starbucks ever!” shouts the lady beside me into her phone. Shows just how much people value their lattes – the same people, I suppose, who nearly broke down into tears to thank teh SBUX for being open, serving those lattes at ten o'clock at night on Thanksgiving. But that's not the point. The point is just how much you really see on a bicycle, the way that you are neither car nor pedestrian. Nowhere you'd want to be is off-limits, you don't have to do anything to switch from "getting there" to "being there". Along the Sound, when Mount Rainier pops into view around a corner like some kind of cartoon mountain, improbably imposing and bright, the constant undulations of Marine View drive show me just how awesome of a machine the human body really is. I think people miss out on this. But as I stand up on the pedals around another soft corner, accelerating up a rolling little hill, I smile in spite of everything, anything, else that might be happening all around me. Not bad for human-powered, is it? It took me about two hours to ride from Milton to downtown Seattle, as opposed to a car taking perhaps forty minutes. But, really, slinging along the wide, straight Interstate at sixty-five miles an hour, what do you really see, let alone experience? And, then, let's pretend that instead of leaving at ten thirty in the morning, we left at eight. Do you enjoy the traffic? Does the congestion make your day the way that riding makes mine? Sure, I'd be slower riding if I had to get to work and carry, say a change of clothes and shoes, but you'd be slower, too, in all that gridlock. Then you'd have to get off of the freeway, navigate messy downtown traffic, find a parking space, pay for parking. If you got gas, I hope you didn't find one of the area gas stations that's recently pulled out a 4 to put in front of the price. Okay, for diesel, but, still, I saw $4.19 today. Wow. So, my point here is that doing all of this on the bicycle turns what might be a series of unconnected encounters in a day out, Seward Park and Pike Place in Seattle, the One Heart and Point Defiance in Tacoma, and everything in between, is one unbroken string of experience. Conclusion: This is Life. Don't miss out on it while you have the chance. Looks like we ride in the same neighborhoods. I'm riding from Seattle to Federal Way several days a week. Sometimes rolling through Des Moines, Marine View Dr. Other days, Interurban trail, Puyallup and Milton. Any idea where the new Milton trail leads to? Sounds like the same, but backwards, since I am FROM Milton, and sometimes get up TO Seattle! Anyway, the new trail in Milton is actually part of the Interurban Trail. When and if it's ever finished, it'll hook up with the Auburn-Kent part of it and go all the way to Tacoma. That'd be cool. Right now it just goes from 70th, near 20th in Fife, all the way up to almost Enchanted right at Military Road. It's pretty cool. It amazes me that all that little number crap at the end of the receipt all makes totally sense to me now. 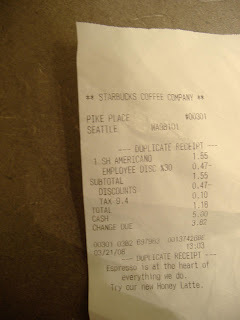 "At store 301, Pike Place, the second person to ring on the bottom of register three was partner number 1374268, a mere barista. If Tyler is unsatisfied, the cash controller will decode transaction #697983 to force a void." I have to open in 3 hours. Spoodle vincat.